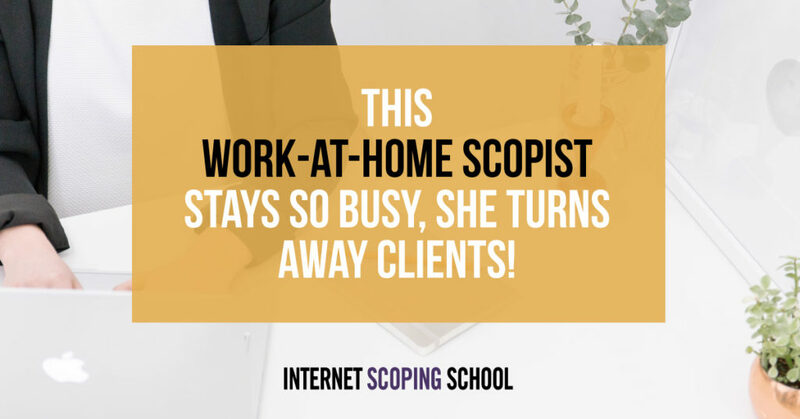 » This Work-at-Home Scopist Stays So Busy, She Turns Away Clients! 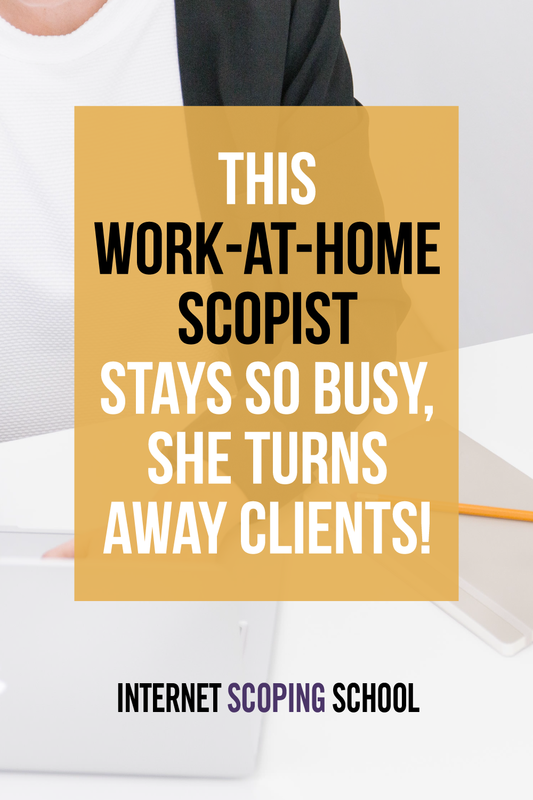 This Work-at-Home Scopist Stays So Busy, She Turns Away Clients! Well, this is pretty much the mother lode of student success stories. I’m so pleased to introduce you to Cindy Clark of The Scoping Studio. She is an absolute gem, and I think you’ll agree. Cindy enrolled in Internet Scoping School more than five years ago and has since become one of the busiest scopists I’ve ever seen! Scoping can provide a healthy income if you’re willing to work hard: Cindy earns between $1 and $3 per page and has streamlined her process to between 20-30 pages per hour depending on the job requirements. So you do the math on that! 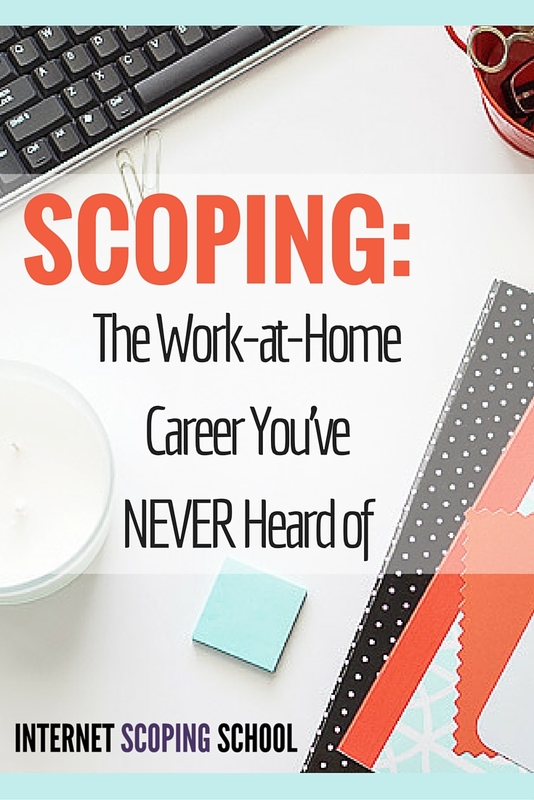 She is one of the busiest full-time scopists in the country! Her work is primarily dailies and expedites which means she can garner a higher page rate than regular turnaround work. This is a very smart business model, but not just any scopist can do it. You have to be an excellent scopist to even get this kind of work, and not every scopist can work under pressure all the time and do it well. But Cindy can. Cindy gets offered plenty of regular turnaround work, but she reserves her availability for quick-turnaround work precisely because of the higher page rate — this means she earns more money in less time. It’s brilliant. So let’s dive in to hear from Cindy. Tell us a little about your background, Cindy! I probably shouldn’t admit this, but I was horrible in English grammar and punctuation in school. All those rules! Ugh! But I loved to read; I read everything I could get my hands on. My mother used to have to kick me out of the house to play instead of reading! My second job as a word processor was with Rockwell International at their Rocky Flats Plant in Golden, Colorado. The manager of our department had us studying The Gregg Reference Manual in weekly classes there on-site, and we had quizzes every week. Our success or failure on those tests made a big impact on our yearly reviews, so being a single mom (and a bit competitive), I had to buckle down and finally slay that dragon! And I did. And it made a huge impact on me, believe me. They also sent us to proofreading classes. Proofamatics was one I remember. I still remember some of those techniques taught in that class. I think it was about five years ago. I had gotten laid off from work and decided I needed to work for myself. I was living in a small town, so there really wasn’t much locally to choose from. While I was looking for ideas, my sister told me she was proofreading for a court reporter and she thought I’d be good at it. So I looked it up and saw there was also something called scoping, which sounded a heck of a lot more fun and more profitable than proofreading. I had actually thought about learning to be a court reporter about 20 years ago, but I never did dive into it for some reason. So I felt kind of like I was going full circle by getting into a part of that world now. I was just afraid to launch a business and fail. After all, there was a money component and I was out of work! But I really had no option. And as it happened, I was able to get on a program called WIA (Workforce Investment Act) at the employment office and they paid for my schooling. I purchased my software right away because I wanted to learn it ASAP. I thought marketing would be daunting, but it really wasn’t. Linda had a lot of ideas within the program on marketing and work ethics and things like that, and I just followed her rulebook! Oh, wow. It was ALL invaluable to me. I devoured everything. The courses that I didn’t think would be that important turned out to be very important to my success as well, and that was the teaching on ethics, how to treat and keep your clients, marketing, and all that. 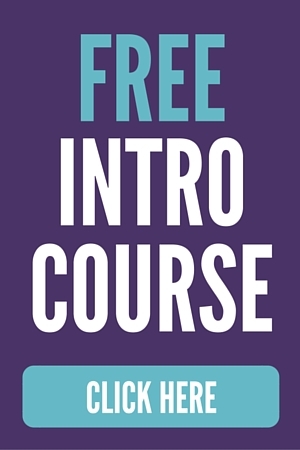 I had my first client before I even finished the course! I had done nearly everything but the practice transcripts, and I was putting my marketing lessons to use. I found a wonderful reporter who was willing to take on a scopist who was still in the learning stages. AND she didn’t try to cut my price, either. She is a good woman all the way around. Five years later, I’ve sent other new scopists to her and she still treats them the same way she treated me. As to income, I was lucky to scope 5 pages an hour on those first jobs. I was sure I had made a mistake! How could anyone scope 20 pages an hour and do a good job? Well, it crept up on me, and now that is my standard amount of pages per hour. Sometimes it’s less and sometimes it’s more. And now I take on a lot of “dailies” and expedites, so the per-page rate is higher and the money is much better. It’s just my husband and me now, but I make enough for the both of us, so he now takes care of the house and everything else and I “bring home the bacon.” This way we both get spoiled! I now have several clients, way more than I need, but I like to keep busy. I have to turn work away all the time. There is no way I could ever take on as much work as what is asked of me. There is definitely a need for good scopists out there! Oh, it’s definitely worth the money, but don’t kid yourself. You HAVE to be able to really and truly learn the rules and learn your software. The more you do, the faster you work. Don’t try to skip anything or slide on anything. Make sure you take Linda’s Word Skills Test in the Industry Fundamentals section. She’ll be honest with you on whether you have the right skills to start or not. And you definitely can’t be the kind of person that needs his or her hand held. You’ve got to be willing to step out there and put yourself on the line. Skills are important; your reputation is even more important. So always be ethical and always give 100 percent to each and every job, even if it means doing fewer pages per hour. Anything else you’d like to share about your journey? Please feel free to visit my Website or my LinkedIn page. I also have a Facebook page where I share tips on scoping. Do a search on the Internet and in Facebook and LinkedIn and find groups to join. Lurk while you’re in school. Take notes. You’ll learn a lot about what reporters are looking for and need in a scopist. When others in those groups ask questions and you KNOW the answer, share the answer. 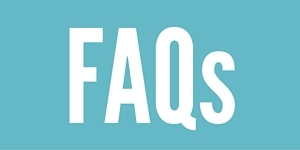 If not, learn the answer and make a note of it for future reference. That’s what I did, and it helped me tremendously. Good luck and God’s blessings! Personally, I think it’s just peachy that Cindy came from a background of less-than-stellar punctuation skills. She saw the value in word skills, though, and pushed hard to overcome that background. It has certainly paid off, and I couldn’t be prouder of her! Congratulations, Cindy! BONUS See what Cindy’s clients have said about her work on her website’s Comments and Recommendations page!